Twin Category 3 tropical cyclones, Trevor and Veronica, pounded Australia’s north coast Friday and Sunday. The more destructive of the two storms was Tropical Cyclone Veronica, since it hit a more populated area and moved very slowly at landfall, subjecting the coast to an extended period of battering. The southern eyewall of Veronica first moved over the coast at 18Z Saturday, when the Joint Typhoon Warning Center (JTWC) rated Veronica a Category 3 storm with 120 mph winds. Moving very slowly towards the coast at less than 5 mph, Veronica managed to keep its eye over water for the next 12 hours, taking advantage of low wind shear and very warm ocean waters of 30°C (86°F) to intensify into a Category 4 storm with 130 mph at 0Z Sunday. By 6Z Sunday, the eye was still over water, but land interaction and increasing wind shear had weakened Veronica to a Category 3 storm with 120 mph winds. Veronica slowly rumbled ashore on the northwest coast of Australia between 6Z and 12Z, weakening to a Category 2 storm with 100 mph winds. A section of coast between Roebourne (population 1000) and Port Hedland (population 14,000) took an extended pounding for more than 18 hours from winds in excess of hurricane force, which likely resulted in severe wind damage. 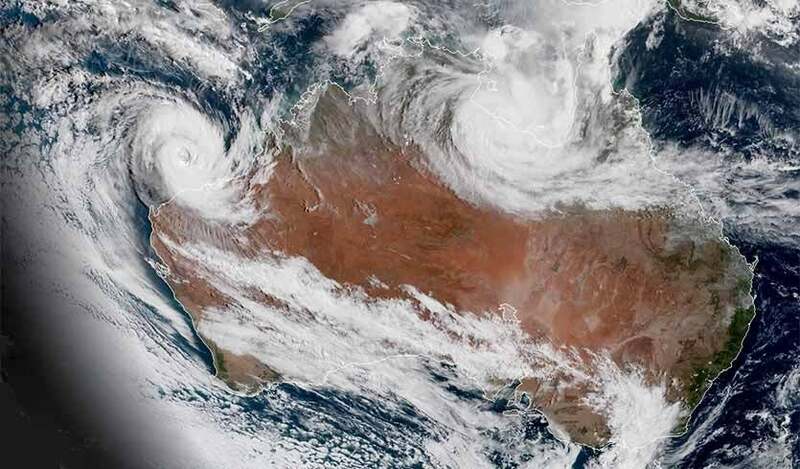 Tropical Cyclone Trevor brought double major trouble to Australia, making two landfalls as a Category 3 storm with 115 mph winds. Trevor’s first landfall came near 07 UTC Tuesday just south of Lockhart River (population 600) in Australia’s Queensland state, where wind gusts of up to 84 mph (133 km/hr ) were measured. The cyclone caused considerable damage to trees and a few buildings, and up to 300 mm (11.81”) fell along its path across the sparsely populated Cape York Peninsula. After taking about a day to cross the Cape York Peninsula, Trevor emerged over the Gulf of Carpentaria as a disorganized tropical storm. Trevor reorganized over very warm 31°C (88°F) ocean waters, and headed south-southwest to make a second Category 3 landfall at 8 pm Friday evening (U.S. EDT) near Borroloola (population 900) in the Northern Territory. Imagine when we get to 500ppm CO2. Or 0??? Do we add or subtract??? Been through several TC's while on Okinawa. If you're used to them, and build appropriately, a Cat 3 will do little damage. Had a few Cat 5's hit while I was there. I laughed at them. Takes a Cat 5 3-4 days to do what a 3 tornado does in 15 minutes. 3. Imagine when we get to 500ppm CO2.